Today’s finds are all over the place, just how I like it. You, too? So much good stuff out there and maybe just enough time to check them out, which I’m hopefully helping you discover some fun and interesting stuff. I’m dying over the edible one, which sounds like a weird attempt at being vague in order to build suspense without overhyping. You’ll have to get there by scrolling through this post. Another dust collector added to my collection with this faceted glass vanity box, shared earlier this week on Instagram. 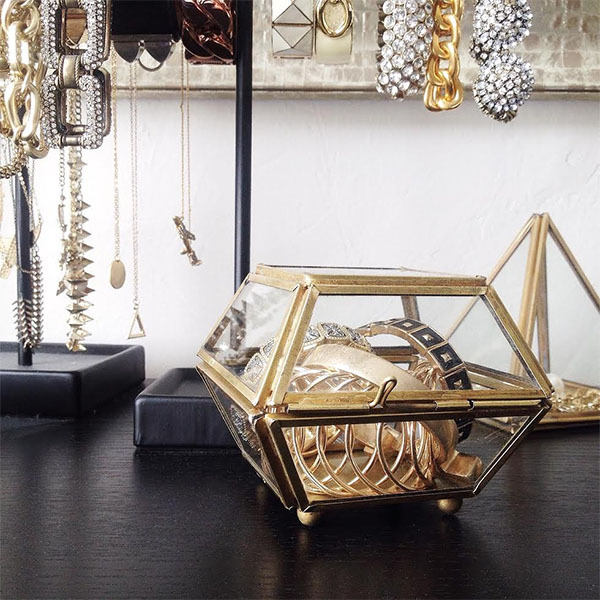 Baubles, trinkets, pretty storage, it’s my jam, and I won’t quit. So far I’ve collected two out of what seems to be a three part collection. I’m holding off on the third… for a bit…. maybe. 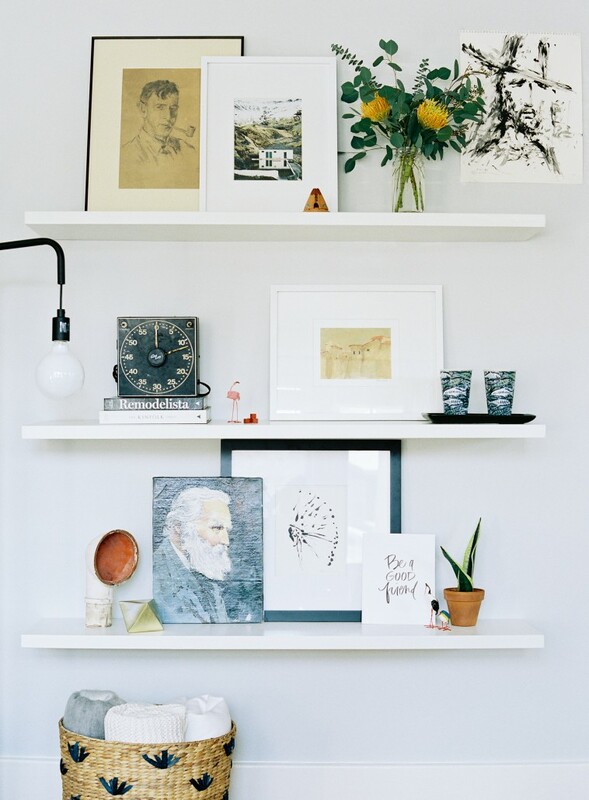 A great step by step guide on how to style shelves. Styling has got to be my favorite part of anything. Wish we had a main shelving display like this one to do it on! 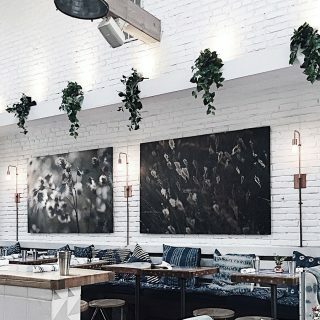 Currently on the hunt for new dining chairs and considering going with color. 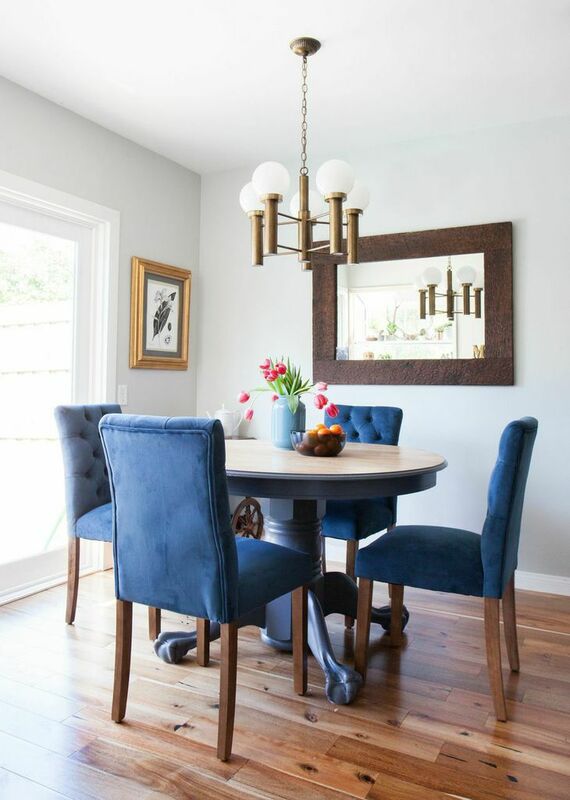 Really inspired by these blue chairs (blue in general lately has been my fancy) which look pretty identical to the ones I have now only mine are beige, not tufted, and sink like craaaaazy when you sit in them. They are so uncomfortable it drives me nuts! Once upon a time, I attempted a nail polish marbling DIY and it went horribly bad. I never shared it because it was hideous, and if I had to point my finger, I’d say it was both using some really old nail polishes and trying to do a million colors at once. I love the way Lidy kept it simple with just black nail polish. The marbling looks so elegant this way. So this donut craze, right. I don’t think I’ve ever felt so strongly about them as I do with these Disney donuts. 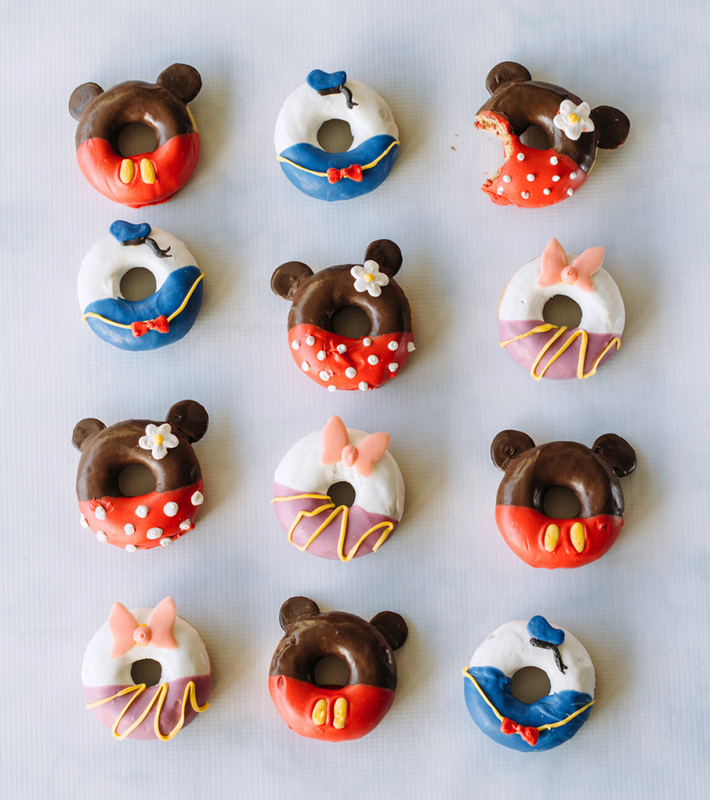 Maybe it’s because I went to Disneyland for the first time not too long ago and it was the best day of my life, but also, these are just so darn cute and creative. I’m crazy about them. Everything 40% off at Kate Spade Saturday with code EXTRA40!! I’ve been eyeing the Mini A Satchel forever. 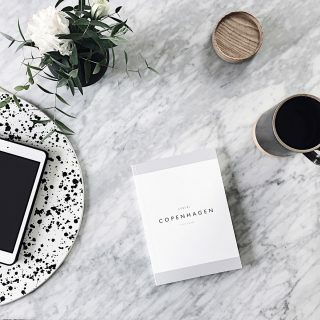 Have you been following the Career 101 series at Cupcakes and Cashmere? I’ve been reading along since I’m starting back up on the job hunt. THIS DRESS COLOR DEBATE. Have you argued with everyone you know about this yet? I’m on team white and gold, and so was boyfriend, until we were about an hour into staring at the photo and all of a sudden he said all he could see was black and blue, which is what it actually is. NOPE, don’t see it. Please feel free to weigh in on this and tell me what colors you see. Have an excellent weekend, friends! Picking things up right back here on Monday. Hi! You are normal like me :D Haha thanks for sharing, Liliana. Those donuts look amazing! Get in my belly! And I love the vanity box. Yesss although I feel like I wouldn’t want to eat the donut because they’re so cute, but of course I’d eventually eat it. Oh I want to talk to you about Disneyland so bad. That was your first trip?! Did you have so much fun. I’m such a Disney nerd. Also, Team Black and Blue over here. No question at all. IT WAS SO MUCH FUN. I went with Disney nerds and I had a great time getting schooled on the world of Disney. I truly wish I could join team black and blue, but it’s just not happening. I could maybe make blue work, but not black, not at all. 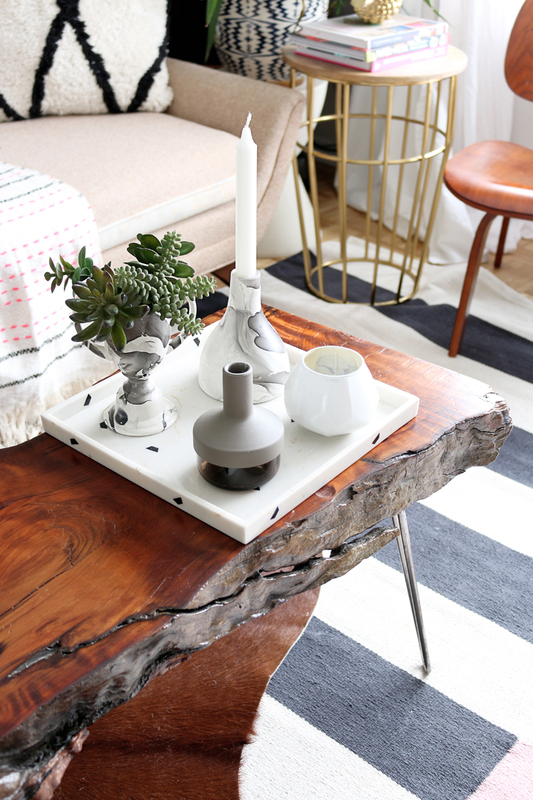 Loving all these fabulous finds! Those shelves are styled to perfection. And I saw black and blue first and now all I can see is white and gold! Have a great weekend, Amy! Yessss you have come to the right side. You are a rarity too, I heard more about people switching to blue and black than switching o white and gold. I’m never looking at that dress again. Thank you for sharing the glass display box from Urban Outfitters… I love it and am going to buy a few of them for my jewelry!! So happy I cam across your blog! !